On Thursday three of our solicitors took a morning out to deliver training to local community groups in Tottenham. 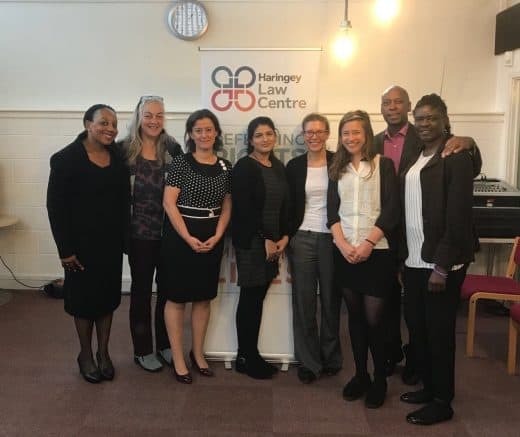 The training was organised with Haringey Law Centre and 60 individuals from a variety of community organisations signed up to attend. Ana González and Eleanor Simon of our immigration department trained on basic immigration law including the law as it effects EU nationals post Brexit. Katy Robinson of our public law department trained on the ‘hostile environment’ for migrants including restrictions on working, renting, bank accounts, driving licences arising from the Immigration Acts 2014 and 2016. Our family law department will be training at a similar event in November.